We live in times in which much has been said about woman, her dignity and her role in the family and the world. Many different opinions have been given on this topic, all trying to give an answer to the questions raised in the hearts of women. But in order to understand woman in her total reality, it is absolutely necessary to enter into the mind and heart of God, her Creator. Pope John Paul II, among many other titles, can be given the title of “the pope of women” because, in his many messages and writings, he has taught us to lift up our eyes to the designs of the Heart of God in creating man and woman and, from there, to acquire a clear vision of the dignity and vocation of women. In his apostolic letter Mulieris Dignitatem (hereafter referred to as MD), citing the Conciliar Document Gaudium et Spes, he writes, “‘man, who is the only creature on earth which God willed for itself, cannot fully find himself except through a sincere gift of himself’” (no.7). Man and woman were created by God out of love and were created with the capacity to love and be loved and, in loving, to find their ultimate fulfillment. We cannot understand the dignity and vocation of women if we depart from this reality: she was created to love. “The dignity of women can only be measured by the order of love” (cf. MD, 29). What is a vocation? It is a call that the Lord places in the heart of the human person. This vocation, this calling, can and should be answered with the totality of the human heart because our hearts are capable of giving an answer of love, of making an act of self-giving. Therefore, a vocation is always an orientation of the human heart to find love and to dedicate oneself to the service of love. A vocation will always imply the total surrender of self for the greatest cause of love. The human person, created to love, will find its fulfillment in the generous giving of self. A vocation is a human reality, since only the human person was created for love, and only the human heart can experience a call to love and respond to it with love (MD, 29). John Paul II was convinced of and affirmed that the vocation of woman is one, and it is her greatest calling: to love with the genius of her feminine heart. Woman, in her feminine being (body, soul and psychology), has inscribed in her heart a special calling of self giving, of self-donation. Men also have the vocation to love, proper to the manly characteristics of their hearts. But it is woman who, in a certain sense, has the vocation and mission to teach men to discover, understand and put into practice the vocation to love. In Mulieris Dignitatum we are told, “In God’s eternal plan, woman is the one in whom the order of love in the created world of persons takes first root” (29). Yes, the loving plan of God and His communication of love – in the heart of woman – is able to firmly take first root, thus making her heart a special place where love can grow, be manifested and become fruitful. What a calling!! In the creation account, man was created first and found himself alone. God saw this original solitude. Can we imagine how Adam felt when he found himself in the midst of all the beauty of creation, but with a heart that was not complete because he did not have another person to love and give himself to? Then God created a woman, “a helper fit for him” (Gen 2:18), another human person with whom communion of love would be possible; a life’s companion, with whom he could unite himself; and from this union of love, they would be capable of transmitting life to new generations, fulfilling in this way the command of God: “Be fruitful and multiply” (Gen 1:28). We can clearly see then, how woman was created by God to enable man to put his love into action; and once she is receptive to that love, it becomes fruitful in the transmission of life. Man becomes complete when he gives his love to woman, and woman is complete when she fosters in man that giving of love, when she receives it and opens herself to life. From the beginning, woman inserts humanity in the order of love (MD, 7). How do women channel the call to love? The realization of the human heart is found in the generous giving of self. Women realize this call to self-donation, which is engraved in their feminine nature, by being spouses and mothers. These are the two interconnected channels by which a woman expresses her call to a generous and sacrificial love, a love that is capable of giving life. The heart and body of a woman – and all of her being – is created to manifest her self-donation in two ways: being a spouse and a mother. Whether a woman embraces the vocation to married life or to consecrated virginity, she lives her spousal and maternal dimensions, but in different forms. Throughout her life, a woman is to form and develop the capacity to put into service the gifts of her femininity and to mature in her ability of self-giving. Women, in their childhood and youth, need to be prepared and to prepare themselves to freely donate, with generous hearts, the gifts and genius of women to the world and humanity: the greatness of her heart, which is based in the vocation given to her by God, that calls her to be a receptor of love, a sanctuary of love, and a custodian of life. Women are to allow love to always be fruitful. As St Maximilian Kolbe always said, “Only love creates.” What a powerful reality: when women are receptors of love they become channels of life. Love is the cause and the reason of their motherhood. Motherhood will always be the crowning of love and will always require a love that is sacrificial. “In September 1961 towards the end of the second month of pregnancy, she was touched by suffering and the mystery of pain; she had developed a fibroma in her uterus. Before the required surgical operation, and conscious of the risk that her continued pregnancy brought, she pleaded with the surgeon to save the life of the child she was carrying, and entrusted herself to prayer and Providence. The life was saved, for which she thanked the Lord. She spent the seven months remaining until the birth of the child in incomparable strength of spirit and unrelenting dedication to her tasks as mother and doctor. She worried that the baby in her womb might be born in pain, and she asked God to prevent that. “A few days before the child was due, although trusting as always in Providence, she was ready to give her life in order to save that of her child: ‘If you must decided between me and the child, do not hesitate: choose the child - I insist on it. Save him.’ On the morning of April 21, 1962, Gianna Emanuela was born. Despite all efforts and treatments to save both of them, on the morning of April 28, amid unspeakable pain and after repeated exclamations of ‘Jesus, I love you. 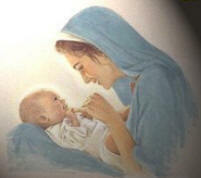 Jesus, I love you,’ the mother died” (Official Vatican biography). Gianna Molla died as a martyr of a mother’s love. Pope Paul VI described Gianna as “a young mother…who, to give life to her daughter, sacrificed her own, with conscious immolation” (Angelus, Sept. 23, 1973). Pietro Molla, Gianna’s husband, quoted his wife as saying to him, “One cannot love without suffering or suffer without loving” (St. Gianna Molla by Pietro Molla, p.151). He remembers the times when she told him, “Look at the mothers who truly love their children: how many sacrifices they make for them!” (ibid.). Motherhood implies from the beginning a special openness to the new person: and this is precisely the woman’s “part.” In this openness, the woman “discovers herself through a sincere gift of self” (MD, 18). Motherhood means opening the heart in love to give life. This opening of the heart usually causes a pain of expansion that moves the heart away from selfishness and towards making an option for love. Yes, motherhood requires not only the expansion of the body, but most of all, the expansion of the heart; as the prophet Isaiah tells us in chapter 54, “Enlarge the space of your tent, spread out your tent clothes unsparingly…For you shall spread abroad to the right and to the left” (vs. 2-3). Dear women, in order to give life, in order to fully be mothers, our hearts must be pierced out of love. The Church was born from the pierced Heart of Christ, and from His wound, graces of divine life flow to all the members of the Church. The Blessed Mother at the foot of the Cross was given, by Christ, Her new maternity over the Church. John Paul II told us in Fatima, “The Immaculate Heart of Mary, opened with the words, ‘Woman behold your son,’ is spiritually united with the Heart of her Son, opened by the soldier’s spear. Mary’s heart was opened by the same love for man and for the world with which Christ loved man and the world” (cf. May 13, 1982). From the Cross, Christ called the Blessed Mother to open Her heart to a new maternity, and just a few moments later, His heart was pierced by a sword and Her Heart was mystically pierced by the same sword. Motherhood will necessarily call the woman’s heart to be pierced, to allow love to triumph over selfishness, self-interest and self-will. Every time life is conceived, the heart is pierced by love because motherhood takes place first in the heart. That is why St. Augustine wrote about Our Lady: “Mary conceived first in her heart by faith before she conceived him by the power of the Holy Spirit in her womb” (cf. Sermon 293). Openness to life is first a disposition of the heart. It is an option freely accepted for love, and this disposes the heart to be open to life. If in our world we have so many abortions today, it is because women have first closed their hearts to the sacrificial love necessary to be open to life. The Prophet Isaiah, in chapter 7, verse 14, announces that the fullness of time will be marked by a sign involving motherhood: “The Lord himself will give you the sign: the virgin shall be with child, and bear a son, and shall name him Immanuel.” In the passage of the Annunciation, the angel Gabriel appeared and told the Virgin Mary, “Behold you will conceive in your womb and bear a son, and you shall name him Jesus” (Lk 1:31). The angel appeared and announced to the shepherds at the birth of Jesus, “Behold, I proclaim to you good news of great joy…for today in the city of David a savior has been born” (Lk 2:10-11). In these Scripture passages, we can see that motherhood has been introduced into the core of the salvific work of God. The fact that God chose to come into the world through a mother, in order to redeem humanity, further dignifies the vocation of motherhood. As John Paul II states, “We see that through Mary - through her maternal ‘fiat’, (‘Let it be done to me’) - God begins a New Covenant with humanity. This is the eternal and definitive Covenant in Christ, in his body and blood, in his Cross and Resurrection. Precisely because this Covenant is to be fulfilled ‘in flesh and blood’ its beginning is in the Mother. Thanks solely to her and to her virginal and maternal ‘fiat’, the ‘Son of the Most High’ can say to the Father: ‘A body you have prepared for me. Lo, I have come to do your will, O God’ (cf. Heb 10:5, 7)” (MD, 19). It is precisely the human body and blood that Jesus received through the maternal cooperation of Mary that He would offer for us on the Cross and offers to us in the Eucharist. Oh, dear sisters, how this maternity changed the world!! Each and every time that motherhood is repeated in human history, God is entering in the world, God is intervening in humanity. The God-Man came to the world through Mary, through Her motherhood, and this motherhood changed history; it changed the history of humanity and the history of each individual: “The history of every human being passes through the threshold of a woman’s motherhood” (MD, 19). The dialogue between the angel and Mary is about motherhood. She is first greeted by the words “full of grace” (Lk 1:28). The Virgin of Nazareth, a woman, has been granted the miracle of being “full of grace” “with a view to the fact that she would become ‘Theotókos’” (MD, 5). Her Immaculate Conception was in view of her maternity. This fullness of grace “signifies the fullness of the perfection of ‘what is characteristic of woman,’ of ‘what is feminine’”: a spousal and motherly heart (ibid). When Mary responds to the words of the heavenly messenger with Her “fiat,” She is elevating woman to the fullness of the feminine gift – her self-donation: “Behold, I am the handmaid of the Lord” (Lk 1:38). She places the gifts of her femininity and of her motherhood at the service of the Kingdom of God and at the service of humanity. “It is precisely this service which constitutes the very foundation of that Kingdom in which ‘to serve ... means to reign’” (MD, 5). In the Kingdom of God, which is a Kingdom of love, mothers are queens because their motherhood is the greatest service to the kingdom. “The Church sees in Mary the highest expression of the ‘feminine genius’ and she finds in her a source of constant inspiration. Mary called herself the ‘handmaid of the Lord’ (Lk 1:38)…Putting herself at God's service, she also put herself at the service of others: a service of love. Precisely through this service Mary was able to experience in her life a mysterious, but authentic ‘reign’…For her, ‘to reign’ is to serve! Her service is ‘to reign’!” (John Paul II, Letter to Women, 10). “The people who walked in darkness have seen a great light; Upon those who dwelt in the land of gloom a light has shone…For a child is born to us, a son is given us” (Is 9:1,5). By bearing in Her virginal and maternal womb the Savior of the World, Mary’s motherhood became the greatest sign for the people that walked in darkness and the greatest channel of grace to the world. Her motherhood has become a luminous sign to bring to the world the light of the Goods News. Her motherhood is a powerful instrument for the evangelization of the world, a world that is so much in need of maternal love, of finding peace and rest in the heart of a mother. We have been called by Pope John Paul II to “go out into the deep” of our difficult world and to take upon ourselves the mission of the New Evangelization. For this much needed New Evangelization, I believe that “the power of motherhood” needs to be revealed and lifted up as the banner under which we embark in this new mission. Why do I believe this? Because the Holy Father John Paul II called Our Lady of Guadalupe the “Star of the New Evangelization” (Ecclesia in America, 11), and Her apparition on our continent was a clear revelation of motherhood. When Our Lady of Guadalupe appeared in Mexico in 1531, the work of evangelization of the first missionaries was not bearing much fruit. She visited this continent revealing, in a very special way, Her maternity. Her dress was full of signs: the black belt was an Aztec symbol of a pregnant woman; the four petal flower over Her womb meant that She was the Mother of God because this flower meant ‘giver of Life’; Her eyes, looking downward, were a sign of Her maternal care and compassion for Her children. The maternal Heart of Mary will always reveal the compassion of God towards humanity, as John Paul II told us in April of 2001: “God’s compassion for man is communicated to the world precisely through the Virgin Mary’s motherhood” (Regina Caeli, April 22). The words of Our Lady of Guadalupe were a clear statement about Her motherhood, and it was precisely this that conquered the hearts of the Indians. She introduced Herself as the Mother of God “I am the perfect and ever virgin Holy Mary, Mother of the True God” (First Apparition, Dec. 9, 1531). And also, She presented Her maternal love over the inhabitants of this land, “I wish and intensely desire that in this place a sanctuary be erected.” For what did She desire this? To show Her maternal love: “so I may therein exhibit and give all my love, compassion, help, and protection, because I am your merciful mother – yours, all who live united in this land, and all those who love me. Here I will hear their weeping and sorrows, and I will remedy and alleviate all their many sufferings, afflictions and misfortunes” (ibid). As we can see, this first message consists of three parts that reveal a maternal heart. First, She asked for a sanctuary, which means a place, like a womb, where She could exercise Her maternal mediation. Mary’s motherhood in our regard is manifested in a particular way in the places in which She meets us – Her dwelling places – places in which a special presence of the Mother is felt in a vivid way. These places sometimes radiate their light over a great distance and draw people from afar. These places are the Marian sanctuaries or shrines. Second, She promised that in the sanctuary She would show Her love to the people, She would show Her compassion to the people, should would give Her help, and She would give Her protection – four activities that are essentially maternal! Third and finally, She affirmed, “I am your merciful Mother.” This mercy is a solemn declaration of a foundational characteristic of a mother’s heart. She points out those to whom She wishes to reveal Herself as a Mother – first, to Juan Diego, the recipient of the message; second, to the inhabitants of the land; and third, to all humanity. In order to receive Her maternal love, they simply must love Her, cry to Her, seek Her, and have confidence in Her. Is there any other way that a child can turn to a mother? In these beautiful words, the Blessed Mother gives a complete affirmation of Her Motherhood. Her maternal heart takes away fear because Her embrace makes the child know that he is not alone in the world; that there is no evil, no suffering, and no difficulty that a mother can not alleviate. A motherly heart gives protection, tenderness, kindness, security...How much we need maternal hearts in our present world. We women of America, called to be mothers in such a difficult moment in history, need to be conscious of the fact that the Blessed Mother has chosen this continent to imprint the image of Her motherhood upon, and She has chosen to leave Her miraculous image as a living sign of the calling of this continent to be a forerunner in the building of the culture of life. In his last visit to the Basilica of Guadalupe, Pope John Paul II prayed, “O Lady and Mother of America…May the Continent of Hope also be the Continent of Life,” and he asked Our Lady to imprint in our hearts the maternal sentiments of Her heart so that we can be instruments of life (Homily, Jan 23, 1999). The Second Vatican Council declared in its Closing Message, “The hour is coming, in fact has come, when the vocation of woman is being acknowledged in its fullness, the hour in which woman acquire in the world an influence, an effect and a power never hitherto achieved. That is why, at this moment when the human race is under-going so deep a transformation, women imbued with a spirit of the Gospel can do so much to aid humanity in not falling” (cf. Proposition 2, as quoted in MD, 1). Motherhood is essential in building a new civilization. Love and Life must be the good news presented to contemporary man. Life must be welcomed as the greatest gift of God to humanity. The hearts of women must be totally disposed to serve the God of love and life. They must break away from the slavery that many times clenches women’s hearts. Women must discover first that their wombs are the sanctuaries of love in which every human life must be welcomed, valued and loved. Women must build in their hearts a new culture in which unconditional love conquers the temptation of selfishness and in which self-oblation becomes the most powerful tool of self-realization. In an Address during the Year of the Family, His Eminence Alfonso Cardinal Lopez Trujillo, President of the Pontifical Council for the Family told women, “Mothers, wives, women of the Church, you are the bearers of the civilization of love! The babe in your arms, the little ones who cling to you and gather around you, these are called to be tomorrow's civilization of love. That questioning child, the teenager seeking his or her identity and asking for affirmation, they already stand on the threshold of that civilization. But what will it be a civilization of life and love or a civilization of death and hatred. It depends on you” (10th annual conference of Women for Faith & Family, 1994). Women must be at the center of the new civilization by being eloquent witnesses to love and by educating children to love: teaching them care for others, the beauty of self-giving, the values of self-sacrifice, and reverence for and welcoming of a new life. This education for love must be learned in the true “school of the virtues,” especially those of humility and charity. Women can teach all humanity the values of the heart, the greatness of peace, the prevalence of self-donation over self-preservation, and the dignity of every human being. John Paul II, during an Angelus message in 1995, said, “It must be recognized that, among the gifts and tasks proper to her, her vocation to motherhood stands out particularly clearly. With this gift woman assumes almost a ‘foundational’ role with regard to society” (July 16). And in his Letter to Women he said, “Thank you, every woman, for the simple fact of being a woman! Through the insight which is so much a part of your womanhood you enrich the world’s understanding of the heart and help to make human relations more honest, profound and authentic” (no. 2). I make an appeal to all women whose hearts have been engraved in love and are able to love with a great capacity of self-giving and self-donation, in our society so attacked by selfishness, indifference, coldness and death – you must make a powerful statement: Love is greater, love triumphs, love conquers, love is stronger than death, love is fruitful, and love triumphs in the end. Do not forget that in Fatima the promise of Our Lady was a promise of a motherly heart: at the end my Immaculate Heart will triumph. Mothers, make your hearts full of maternal love; thus, you can make love triumph in our third millennium. only love generates love in others. there, in the place of death, emerges a new space of life. only love is stronger than death” (Song 8:6).